Is this blessing then only for the circumcised, or also for the uncircumcised? We say that faith was counted to Abraham as righteousness. How then was it counted to him? Was it before or after he had been circumcised? It was not after, but before he was circumcised. He received the sign of circumcision as a seal of the righteousness that he had by faith while he was still uncircumcised. The purpose was to make him the father of all who believe without being circumcised, so that righteousness would be counted to them as well, and to make him the father of the circumcised who are not merely circumcised but who also walk in the footsteps of the faith that our father Abraham had before he was circumcised. Paul takes us back, in Romans 4, to the time when God first entered into a formal relationship with humanity. The story of Abraham is told in the middle chapters of Genesis. It is a long story, but Abraham believes in God and is faithful to him. 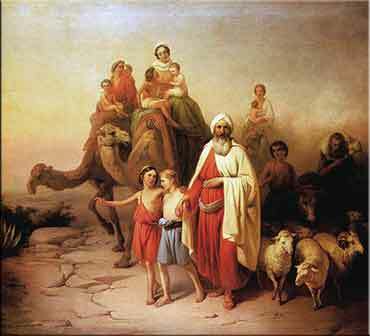 As a sign of his faith, Abraham is circumcised. The Jews became the "people of Abraham" — they were fundamentally Abraham's actual physical descendants — and they followed the practice of infant circumcision as a sign of their obedience, that they accepted the relationship. Over the centuries, the symbol of circumcision became a critical component of Jewish practice. But it was faith that led to circumcision, not vice versa. It was their faith, not a mark on their bodies, that created the relationship between the Jew and God. As Paul puts it, faith was counted to Abraham before he was circumcised. Therefore it is faith, not circumcision, that lay at the heart of the convenant between the Jews and God. But Paul takes it even further; if it was faith that lay at the foundation of Abraham's covenant with God, then Abraham was the father of all faithful people — not just the Jews, but also monotheistic Gentiles. This theme reoccurs often in Romans, because the Jews were taught from childhood that they, and no others, were righteous before God. They were taught that a Messiah would come to rescue Israel. And, indeed, Jesus was the descendant of Abraham, Jesse, and David. Thus, when the Messiah came, it was understandably hard for them to hear the opposite: that Gentiles as well as Jews were the beneficiaries of Christ's death and resurrection. But it was critical for Paul to reconcile Jewish and Gentile Christians, so that there would be one unified church, consisting of all those with faith in Christ. He wanted to demonstrate that Christianity, although the culmination of Judaic tradition, was available to all who believed in Christ.